London Metropolitan University is one of the foremost providers of undergraduate, postgraduate, professional and vocational education and training in Britain. The University was created on 1 August 2002 by the merger of London Guildhall University and the University of North London. The university employs 4,000 staff and has approximately 34,000 students, including overseas. It has affiliate institutions in China, Nigeria, Pakistan and India. Technology plays an important part in the smooth running of the University – from providing access for students and staff to research and documents, to using technology in the classroom and lecture theatres. Clearly such reliance places high demands on the IT staff – not only ensuring that the IT systems are kept up to date, but that in the event of problems – such as in classrooms when the projector stops working – a fix is rapidly provided. With so many students and staff to support, the 160 strong IT and telecoms staff play a key role in the University’s operations. Providing a central part in IT is the Service Desk, for which the University has invested in Hornbill’s service management platform, Supportworks. Since the initial implementation in the summer of 2005, the IT team has improved its service significantly, from previously providing disparate support, to providing support to anyone around the world, with one phone number, one email address and web SelfService, whatever the problem. Prior to the merger, the two University sites each had its own IT Service Desk – one was using HEAT® from FrontRange and one was using Supportworks from Hornbill. The previous two desks had disparate technology and two very different sets of policies and procedures. The newly formed IT team decided to go through a formal tender process, involving redefining requirements and reference visits. The University was particularly impressed with Hornbill’s integration capabilities, the existing, proven support that Hornbill provided and for its adaptability to provide a range of services to staff and students of the University. All students now receive the same service regardless of location – without using a tool like Supportworks the IT team could not provide this service. The system is used by first, second and third level support personnel and covers all IT and telecoms requirements. 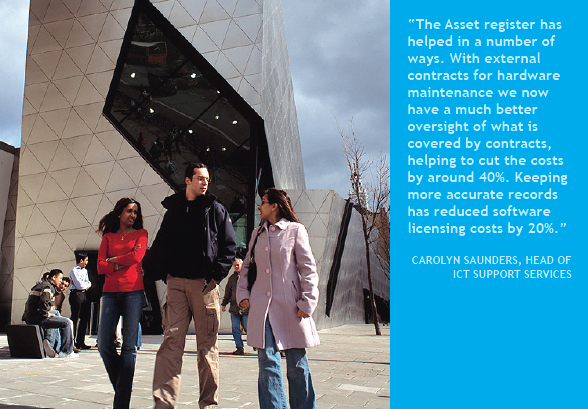 Within the implementation of the project it was important to get a consolidated asset register. Now that the University knows exactly what equipment and software it has, it can leverage the tools they already have, such as desktop management. Assets can be shared across departments – for instance, if a PC is no longer required in one area it can be redeployed elsewhere within the institution. Hornbill also worked with the University to build the integration with other systems such as student records systems, enterprise directories of staff authentication records and desktop management systems. The University is able to provide support to part time and overseas students via a password-secure Student Portal. Students and staff have 24/7 access to the knowledge base and FAQs. This facility also frees up service desk staff from routine queries – they can concentrate on calls that require personal interaction, and so provide quicker, more effective and professional service. The IT team is expecting to bring Media support on board soon with a new service for classroom technology such as presentation equipment. With Media support the staff will ring one number to access the centralised Service Desk, which ascertains the problem and then coordinates the resources to fix the problem – whether projector, PC software, hardware or network. The ICT department now has comprehensive reporting facilities enabling them to deploy staff more efficiently. They have information on work required across all locations, enabling them to allocate work to the technicians based on their location (the university has seven different technician locations and supports over 20 buildings), to make most effective use of their time. Following the implementation of Supportworks, the ICT Support Services department is now able to work to SLAs. The reporting facilities within Supportworks enable the team to see how many calls are dealt within SLAs, so that they are able to monitor and improve the service. This has led to an increase in focus and subsequent improvement in productivity. Weaknesses in staff skills or in the knowledgebase can be highlighted and remedial action taken. Throughout the implementation and ongoing development, Hornbill continued to work closely with the University and together the university and Hornbill were finalists in the 2007 SDI Awards in the category of Best Business use of Support Technology.